When it comes to success, it's easy to think that ingenious, intelligent, and diligent people will inevitably become successful entrepreneurs. The Founder Institute (FI), an American business incubator, found no correlation between these traits and an entrepreneur's statistical chance of success. In fact, it seems that IQ has very little predictive value. People with a positive, creative and growth mindset know that they're going to fail from time to time. Nonetheless, they don't allow that to keep them from expecting positive results. Expecting positive results keeps you motivated and feeds the cycle of empowerment. As Henry Ford once said, "If you think you can or you think you can't, you're right." A positive attitude always beats a negative one. The magic mix is creativity, positive thinking, and curiosity. Entrepreneurs find creative, new solutions to on-going problems thanks to their willingness to go outside the box, move away from the status quo, and explore new opportunities. With a fixed mindset, one believes they are who they are and it cannot be changed. This creates problems when facing challenges. Anything that appears to be more than what they can handle comes with a feeling hopelessness and overwhelm. People with a growth mindset believe they can improve with effort. Even with a lower IQ, they outperform those with a fixed mindset, because they embrace challenges and treat them as opportunities to learn something new. Common sense suggests that abilities such as being smart, inspire confidence. Indeed, they do, but only while the going is easy. We all feel helpless at times. How we react to that feeling of defeat is the ultimate test. We can either learn from it and move forward or let it drag us down. Many successful people probably would have never made it if they had given in to feelings of helplessness. Walt Disney was fired from the Kansas City Star because he "lacked imagination and had no good ideas"
Oprah Winfrey was fired from her job as a TV anchor in Baltimore for being "too emotionally invested in her stories"
Imagine what the world would have looked like if any of these people had given in to the idea that failure is final; if they had succumbed to the rejection and given up hope. Empowered people pursue their passions relentlessly. Someone is always going to be more naturally talented than you are. Nonetheless, what you lack in talent, you can make up for in passion. Empowered people's passion is what drives their unrelenting pursuit of excellence. For instance, Warren Buffet recommends the 5/25 technique for finding your truest passions. Write down the 25 things that you care about the most. Then, cross out the bottom 20. The remaining 5 are your true passions. Everything else is merely a distraction. People with a growth mindset aren't braver than the rest of us. They simply KNOW that the best way to overcome fear and anxiety is to face them; to GO; to take action. People with a growth mindset are empowered, and empowered people KNOW that "perfect moments" to move forward don't exist. Thus, there's no need to wait for one. Taking action turns all your worry and concern about failure into positive, focused energy. Even on their worst days, successful entrepreneurs give it their all. They're always pushing themselves to go the extra mile. If you always put limits on what you can do, physical or anything else, it'll spread over into the rest of your life. It'll spread into your work, into your morality, into your entire being. How you do one thing, is how you do everything. If you aren't getting a little bit better each day, then you're most likely getting a little worse. Everyone encounters unanticipated adversity. People with an empowered, growth-oriented mindset embrace adversity as a means for improvement. When an unexpected situation challenges an empowered person, they flex – they bend, but don't break - until they get results. They look for opportunities instead of complaints, and, eventually, they find the diamond in the mud. Successful people seem to have a knack for knowing their own strengths and weaknesses. They are life-long learners that keep adapting and growing. They stay curious and exploring the views of others. This helps inform, enhance, and shape their views of their world so they can survive and thrive. This is what sustained success is made of. 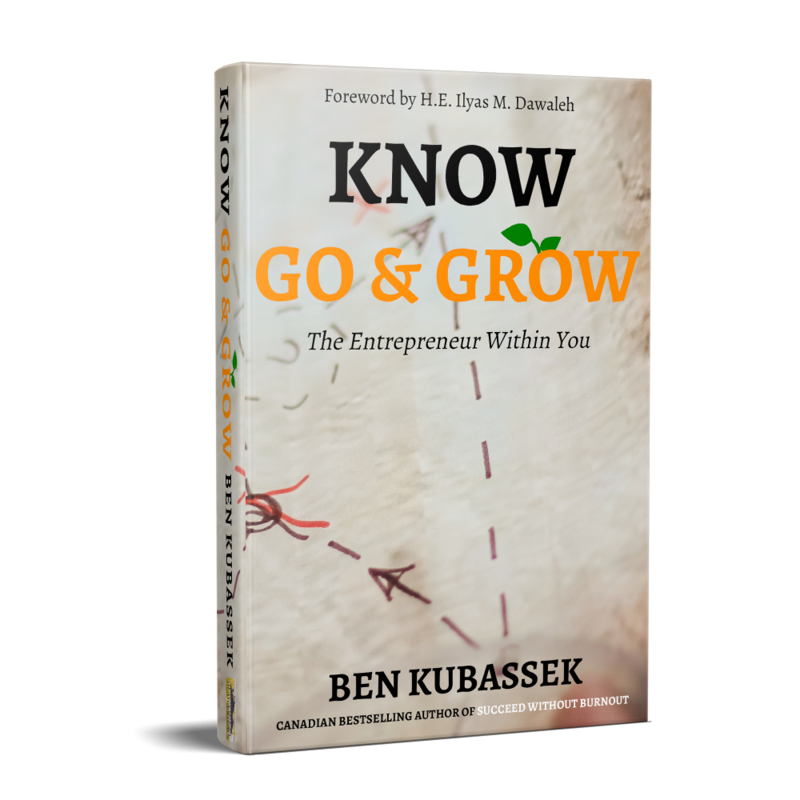 From my new book KNOW GO & GROW: The Entrepreneur Within You. Get your copy today at Amazon.